Following the success of their previous album, "A Mind's Chronicle", in 2011 the band is releasing its brand new self-titled release. 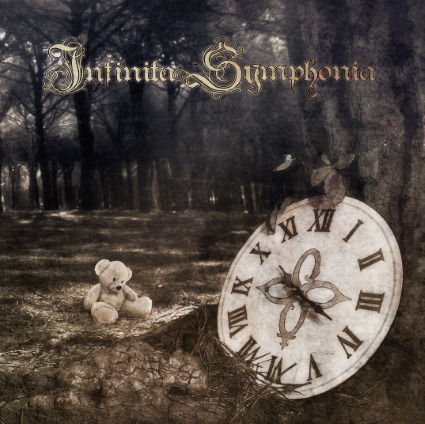 Infinita Symphonia has its roots in the classic melodic power/symphonic metal sound with some hard rock or even 'modern' rock pinches as well. In this album, we, also, have the participation of the legendary shouter Michael Kiske on one song, "Fly". To be honest, I wasn't familiar with the band's previous album but something inside me told me that I would like this one; and, yes, after the first spin I liked this album!! For example, in the opening track of "If I Could Go Back" I caught myself pushing the repeat button several times 'cause it's about a simply fantastic and extremely melodic power metal stuff in a way that I like this kinda of music. The guitars, the performances the melody and generally everything here is perfectly balanced!! "Welcome To My World" is a very interesting tune; it's heavy, melodic but, also, has a cool groove in it that's givin' an extra flavor to the final result. "Fly", which features Michael Kiske, is one of the album's highlights! This is a solid heavy rockin' song in the vain of Kiske's latest work with Unisonic and includes strong performances, great arrangements and a very nice harmony!! "Waiting For A Day Of Happiness" is a kinda of mid-tempo acoustic rocker with a cool rhythm and passionate vocal lines. The track that closes this really interesting release is titled "Limbo" and it's again an excellent example of how talented this band is when it comes to write and perform a classy hard rock tune with a breathtaking guitar line!! Brilliant song!!! Closing, I have to add that these guys surprised me in a very good way with their music. All of the tracks here are well-played, well-performed and one thing is sure here; these guys have talent and know how to write good songs!! The guest of the legendary Michael Kiske is givin' the extra something to the final result but even with or without Kiske this album is a must have for every single fan of quality melodic power metal sound.